In this post, I summarize a portion of the issues relating to River Flows: Summer Flows. Previous posts covered fall, winter, and spring flows. Summer flows have long been neglected in water management and water quality standards. This absence is a major factor in the decline of salmon, steelhead, sturgeon, Delta smelt, and other Delta native fishes. River flows in summer drive many natural ecological processes in the Central Valley related to reservoir tailwater spawning, egg incubation, and over-summer rearing in Valley rivers. Valley rim dam releases are prescribed to meet these needs as well as water supply demands. All four salmon runs, steelhead, Pacific lamprey, and white and green sturgeon are dependent on river flows in summer. Below Shasta Reservoir on the Sacramento River, flow is necessary to sustain (1) salmon eggs/embryos, fry, fingerlings, and smolts of winter-run salmon, (2) juvenile fall-run, spring-run, and late-fall-run salmon; (3) juvenile steelhead, and (4) newly hatched fry of green and white sturgeon. Below Oroville and Folsom reservoirs, flow is needed to sustain juvenile steelhead as well as numerous over-summering smolts and pre-spawn adults of both spring-run and fall-run salmon. The Sacramento and San Joaquin Basin Plan (Central Valley Basin Plan) prescribes water quality objectives to protect these beneficial uses. The applicable key water quality objectives are for water temperature and streamflow. During the dry summer season, much of the Central Valley and Bay-Delta water supply and environmental needs depend on water releases from storage reservoirs. Reaches above the reservoirs and non-dammed streams depend on springs and snowmelt. Like spring-run salmon in un-dammed tributaries, spring-run adults downstream of rim dams, most notably on the Sacramento, Feather, and Yuba rivers, must hold over the summer awaiting their September-October spawning season. Winter-run salmon continue to spawn into August in the Sacramento River below Shasta; their progeny, and the progeny of those that spawned earlier in the summer, are sustained by cold-water dam releases as embryos in gravel beds. Throughout the summer, winter-run fry move out of their redds downstream of Shasta. Water released from Shasta must be sufficient in amount and cold enough to sustain salmon eggs/embryos, fry, fingerlings, smolts, and over-summering and newly arriving adults, as well as young steelhead. Sufficient river flows are necessary in over 200 miles of the lower Sacramento River to keep water temperatures below lethal levels for salmon, trout, and sturgeon. Adult fall-run salmon, whose migration begins in summer, need cool water (<70°F) to commence their run from the Bay up the river. The Central Valley water quality plan’s limit of 68°F for the river is rarely enforced. 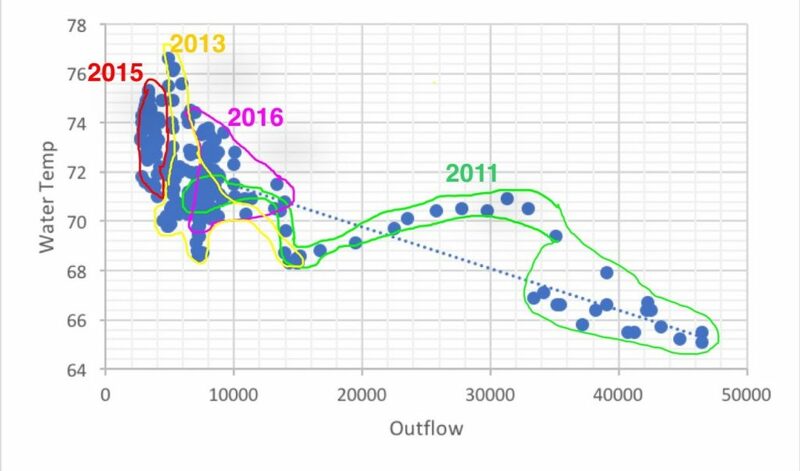 Sacramento River flows of 6000-8000 cfs downstream of the major irrigation diversions are necessary to maintain the required water temperature, but these flows and are met only in wet years (Figure 1). The same holds true for the San Joaquin River, where low flows and high temperatures in late summer hinder that river’s salmon runs. Summer river flows into the Delta are also important in maintaining water temperatures within sustaining levels for Delta smelt (<73°F). Under low Delta inflows, not only is the smelt critical habitat warmer (Figure 2), but it is further upstream in the Delta, away from cooler Bay breezes. 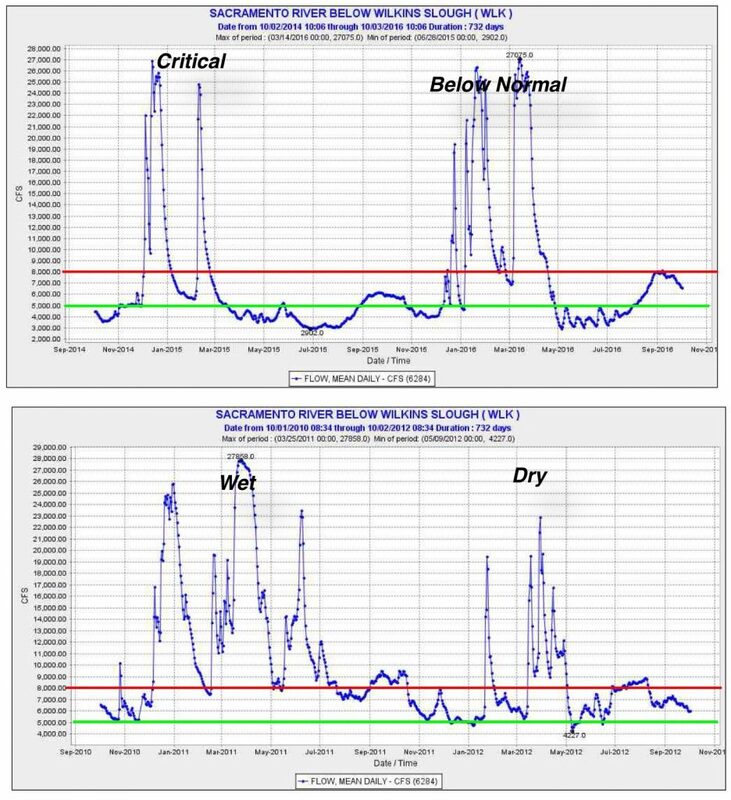 Further, during the summer, Delta water temperatures reach critical levels (>73°F) far more often under low Delta outflows (~5000 cfs) than moderate outflows (~10,000 cfs) (Figure 3). In summary, river flows and water temperatures in summer are critical habitat needs. These needs require stronger summer flow standards and additional management attention to protect the salmon, steelhead, sturgeon, smelt and other species dependent on Central Valley and Bay-Delta habitats during summer portions of their life cycles. Figure 1. River flow (cfs) in lower Sacramento River below major irrigation diversions in four recent years representing four water-year types. Green line represents minimum flow needed to maintain essential ecological processes in the lower river and Bay-Delta. Red line represents preferred minimum level protecting ecological processes. Summer flow is generally depressed even in wet years. Figure 2. Water temperature in the north Delta channel of the Sacramento River 2008-2016. Red line denotes 73°F limit of sustainability for Delta smelt. Figure 3. Delta outflow and water temperature (daily average) at Rio Vista in the north Delta channel of the Sacramento River in summer (mid-June to mid-August) of four recent years: critically dry years 2013 and 2015, below normal year 2016, and wet year 2011. 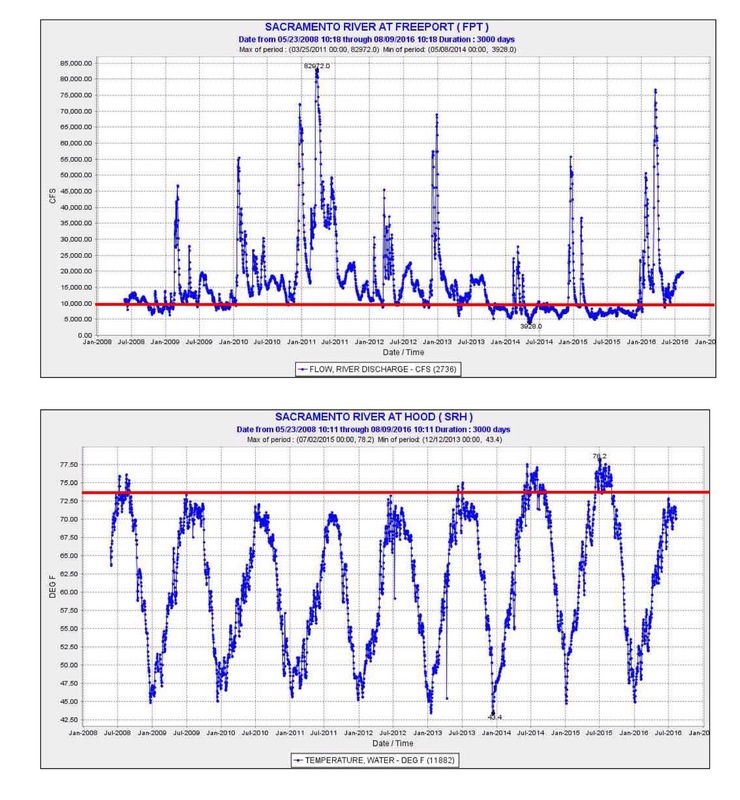 Note that the daily averages are not independent from one another within years, and the effect of air temperature is not shown. Regardless, the effect of flow on water temperature, particularly in the readily controllable flow range of 5,000-15,000 cfs, appears significant among years. Source: CDEC. “Recent modeling advances reviewed here give deeper insight into the interacting causes of SRWRC’s vulnerability to extinction and add further support to the need for the high-priority actions identified in the SRWRC recovery plan.” Models show the continuing risk posed by the existence of just one spawning run, downstream of Shasta. The NMFS Recovery Plan prescribes a Battle Creek population and an above-Shasta population. Progress toward both has been slow. “Winter run chinook salmon have gone through several major droughts in 1977-76, 1988-92, and 2013-2016 where environmental conditions were extremely poor. With each new drought, new insights are realized and additional levels of management actions are taken, or proposed using an ever-increasing science based knowledge base.” Over the years, there have been major actions to improve the condition of winter run salmon downstream of Shasta: (1) a temperature control tower at Shasta Dam, (2) removal of the Red Bluff Diversion Dam, (3) screening of major Sacramento River water diversions, (4) the addition of a winter run hatchery, and (5) restrictions on winter exports from the Delta. All of these actions have certainly helped. However, the continuing drawdown of Shasta Reservoir during dry years leads to loss of the cold-water pool and to low water releases. These conditions undermine spawning, egg incubation, rearing, emigration survival, and thus limit subsequent adult spawner returns. Better water management below Shasta is essential for winter run salmon recovery. “Lessons from the ongoing drought have highlighted the potential benefits of improved forecasting capabilities of temperature dynamics above, within, and below Shasta Reservoir for better management of cold-water resources.” The lesson learned is that agencies cannot stretch water deliveries to the limit without jeopardizing short- and long-term water supplies and salmon habitat conditions. Poor forecasting tools have not helped. Improved monitoring has helped. But in the end, it has been risk-taking that has undermined the winter run salmon population. Chief among the risks have been flow and temperature regimes at or worse than the known tolerance of the salmon. “We conclude that descriptive models of thermal tolerance can drastically underestimate species responses to climate change and that simple mechanistic models can explain substantial variation in the thermal tolerance of species.” In other words, reliance on the tolerances of eggs and embryo salmon as observed in the laboratory fails to take into account nuances in the river habitats of salmon. Such reliance underestimates the effects of management actions. “New science” will lead to more conservative prescriptions for protecting salmon in the future, with corresponding impacts to water supply. “Infection by the myxozoan parasites, Ceratonova (previously Ceratomyxa) shasta and Parvicapsula minibicornis, has been observed in all Sacramento River adult runs, and juvenile fall and winter-run Chinook. In 2014, infections were lethal for over half of the spring out-migrants sampled from the lower river. In fall of 2015, sentinel juvenile salmon, held above Red Bluff diversion dam, incurred a high prevalence of severe infection.” Another consequence of very low river flows in fall and winter of drought years is the prevalence of disease, which reduces survival of rearing and out-migrating salmon. This may be the most significant new science, because it could lead to more protective water quality standards in the Sacramento River downstream of Shasta. “Non-natal habitats that could be identified were the Mt. Lassen tributaries (used by 56%, 19%, and 15% of all non-natal rearing fish from escapement years 2007-2009), the American River (22%, 40%, and 38%), and the Delta (11%, 36%, and 32%). The time period spent within the non-natal habitats ranged from approximately 2 to 16 weeks. These results suggest the extent of WRCS juvenile rearing habitat is likely under sampled and that non-natal habitats are potentially contributing significantly to the WRCS spawning population. Thus, we believe protecting and restoring,non-natal rearing habitats can play an important role in recovering the winter-run Chinook salmon population.” It has been long known that Chinook salmon use non-natal tributaries in the Central Valley for rearing. What is new is the understanding of the extent of this life history pattern. Winter run are known to start their emigration in the fall and spend much of the winter in the lower River and upper estuary before migrating to the Bay and ocean in late winter. The 2 to 16 weeks spent in lower tributaries and other floodplain habitats can double the weight of smolts and greatly increase their survival potential upon reaching the ocean. This research is likely to result in more emphasis on habitat restoration in the lower tributaries. “Ultimately, the productivity of the shelf ecosystem is tied to the survival and growth of the out-migrating salmon…. Larger out-migrating individuals, when faced with an unproductive ecosystem, have a greater likelihood of survival.” Survival of young salmon is tied to freshwater conditions that promote growth: habitat. food availability, water temperature, and flows. 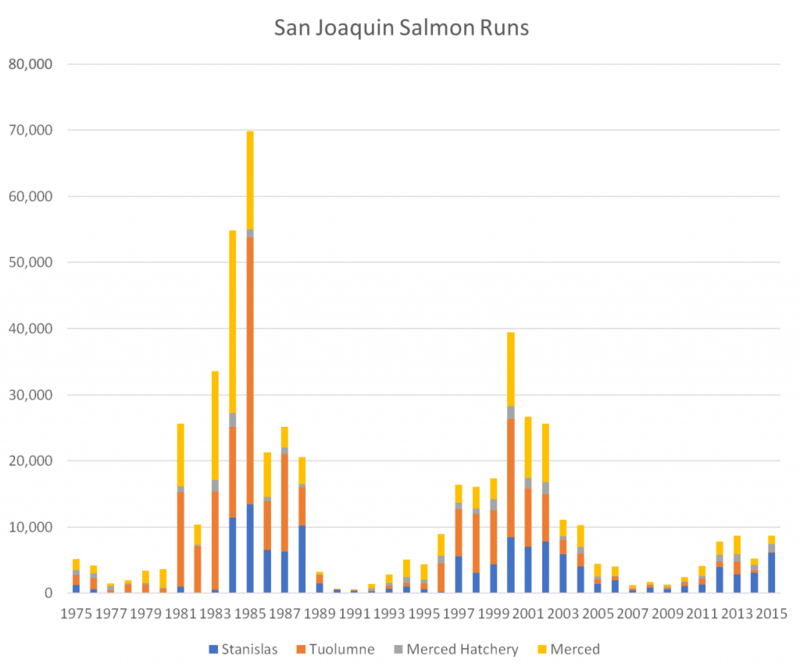 Recently, I wrote about the fall Chinook salmon runs on the San Joaquin River and its three major tributaries over the past six years. Salmon counts in San Joaquin tributaries showed an increase in returning adults in 2012-2015 compared to the devastating returns in 2007-2009. This increase occurred despite the five-year (2012-2016) drought in the San Joaquin watershed. The number of spawners in 2012-2015 was still well below the returns in the eighties and nineties that corresponded to wet water year sequences. See Figure 1. A close look at recruitment per spawner in the population over the past 40 years (Figure 2) provides clear evidence that recruitment suffers in years with dry winter-springs or dry falls. That relationship overwhelms the background relationship between spawners and recruits three years later. Recruitment is significantly depressed in drier years compared to wetter years. The major contributing factor is likely poor survival in winter-spring of juveniles in their first year. Recruitment is severely depressed for year classes rearing in critical years and returning as adults two years later in critical years (e.g., 88, 89). Recruitment can be depressed for year classes with good winter-spring juvenile rearing conditions but poor conditions when adults return (e.g., 05, 06). Recruitment can be enhanced for year classes with poor winter-spring young rearing conditions but very good fall conditions for adults returning (e.g., 81). Recruitment was enhanced in recent years likely as a consequence of increased flow requirements since 2009 (e.g., 09-13). There is an underlying positive spawner/recruit relationship, but it is overwhelmed by the effect on recruitment of flow-related habitat conditions. Figure 1. Chinook salmon runs in the San Joaquin River as comprised by its three spawning tributaries from 1975-2015. 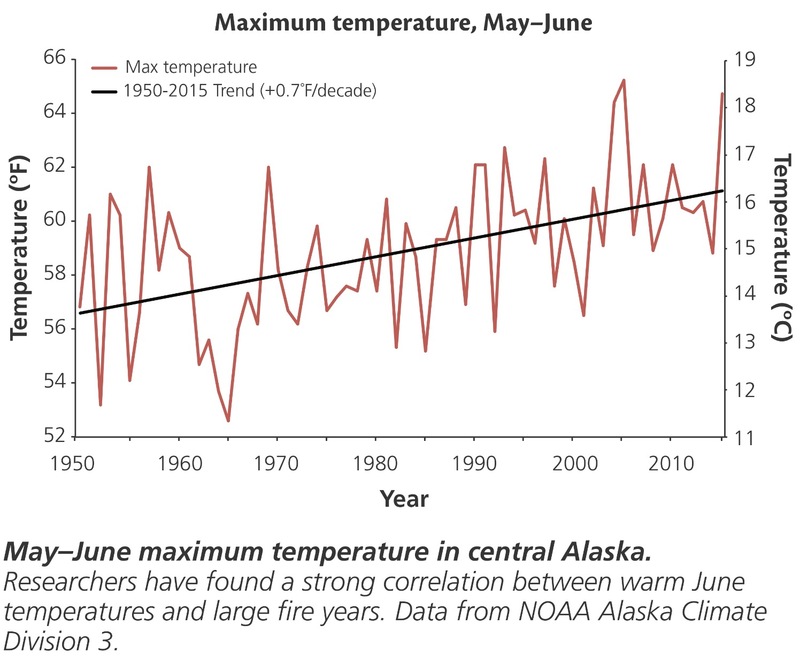 Data source: CDFW. Figure 2. Recruits per spawners relationship ((log10X)-2) for San Joaquin River fall run Chinook salmon 1976-2015. The year shown is the year that the salmon were rearing as juveniles in the rivers in their first year of life. (For example: year 13 represents the progeny of the fall 2012 spawn; these juveniles in 2013 would have spawned as 3-year-old adults in 2015). Red years are critical and dry water years. Blue years are wet water years. Green years are normal water years. 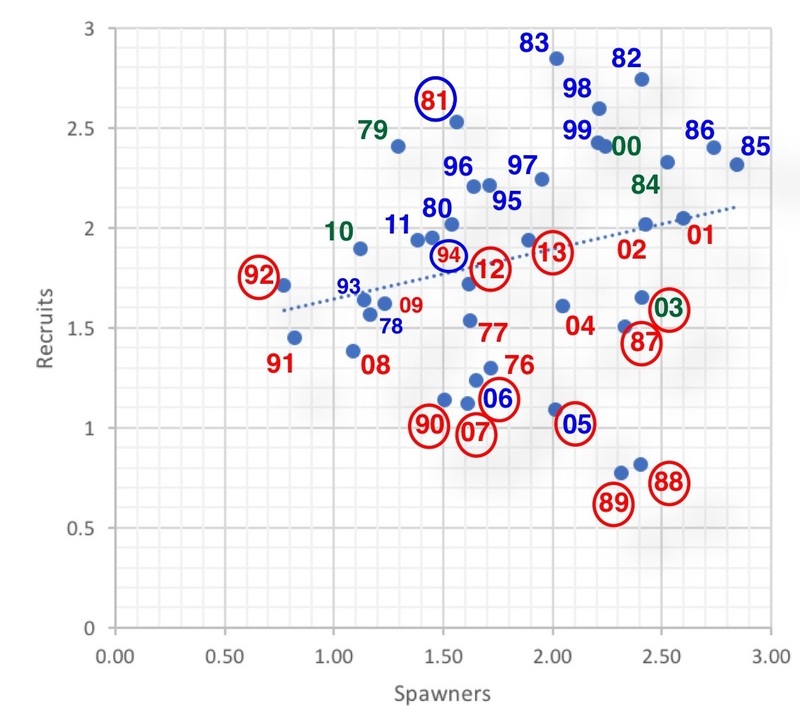 Red circles represent years when fall conditions during spawning would have reduced recruitment (for example: year 13 red circle indicates poor fall conditions during the fall of 2015). Blue circles represent years when fall conditions were good when recruits returned. (For example: year 81 has blue circle because 1983 fall conditions were good/wet year). Note that year 14 is as yet unavailable for inclusion in the dataset because run counts for fall 2016 are not yet available.